As of October 2017 all MLC fonts have received a major update. 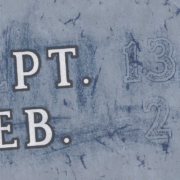 The update includes some kerning updates and even a few new OpenType alternates in some fonts – but the main update includes a second set of fonts (TTF and OTF) using memorial “physical” sizing. It is recommended that all users who purchased fonts before October 1, 2017 log in to the website and download the updates from their downloads page. If you receive a message that you have run out of download permissions, contact the MLC to have your permissions reset. What exactly is the “physical” sizing update? 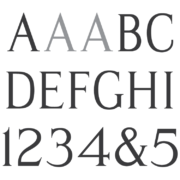 The fonts created using “physical” sizing have had the ascender area removed, forcing design software such as Adobe Illustrator or CorelDRAW to give the user the actual physical letter height desired. 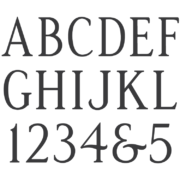 In these programs, if a 1″ height is input for a font the user will not recieve a 1″ letter, as the height of the font is calculated by the cap-height plus the ascender area of the font. In the print industry this is how the height of type is calculated. However, in the sign-making and memorial industry this makes for a bit of confusion and is not a desirable outcome – especially when trying to match existing lettering. The downside of the “physical” sizing method is that because the ascender area is removed from the line-height, the spacing between lines is greatly shortened. In most cases this is not an issue, but when using letters with diacritic marks for multilingual layouts, the marks may run into the text above or below the letter. This is easily fixed by manually adding more space between lines (leading). MLC font users now have the option of installing the fonts using either print sizing or physical sizing, which are included in separate folders in the download file. For more information on the sizing update, as well as all features included with MLC fonts, visit the Font Project Page.